This NetEnt Double Stacks slot machine is a 5 reel, 10 payline game with free spins and stacked wilds leading to wins up to 1,000x your bet. At it’s heart it’s a simple slot game from NetEntertainment, full of action and the chance to win some impressive cash amounts. A bright and colourful slot theme much like their Starburst and Twin Spin games, fills the reels with the higher paying Diamonds, Bars, Bells and 7s as well as the lower paying fruits of cherries, melons, plums and lemons. It’s a theme that will capture many a slot fans attention mainly thanks to a few key features, including the free spins. The diamonds, bells, 7s and BAR symbols are not only the highest paying of the the lot, but also are the only ones to come stacked during the main game. This can give you some decent opportunities at some big wins throughout your spins of this medium to high variance game. But in good old NetEnt fashion, that’s not all. This game comes with it’s own self titled slot feature which much like their much older Flowers slot game, has the chance to Double it’s symbols. How? Well, in this case if you fill a reel with the same symbol those symbols will double leading to hopefully bigger winning combinations. It’s what will keep your game play on its toes and also your casino balance ticking over. But it much like many slots with free spins, is the free spin bonus that you’ll be on the look out for here. You’re going to want to find 3 or more of the scatter symbols throughout your spins to trigger the free spin games here. More often than not you’ll find 3 scatters and those five free spins. Which might seem disappointing, but these bonus games come with a wild card that could see some interesting winning combos. The Wild is represented by the golden star and comes stacked in the free spins. Substituting for all other symbols except the scatters this gives you better odds of creating a winning combo. Add the Double Stacks feature in to the mix and you could be looking at up to 1,000x your bet wins. Don’t expect that big though with a good round giving you about 50 – 100x depending on how many you start with. You can of course be lucky and get more spins by finding 2, 3, 4 or 5 scatters which will give you an extra 2, 5, 15 or 30 respectively. Which is what we did getting over 230x our bet thanks to 4 initial scatters and 15 free spins and then getting 8 more free spins through re-triggers and landing those stacked wilds. Is this Double Stacks online slot worth a spin? 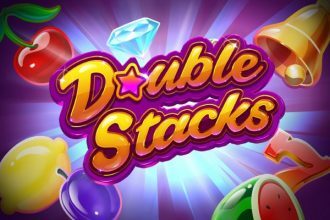 If you’re a fan of fast paced spins and the chance to have some fun thrills along the way then this Double Stacks mobile slot and online game are worth taking for a spin. With the minimum bet of just 0.10 per spin it gives all beginners and experiences players the chance to spin, especially as the max bet is 200. You might have to wait a while and budget your cash to trigger the free spin rounds but that might just be worth it with some impressive wins possible. Overall with a 96.41% return to player rate, those double paying and stacked high paying symbols along with the stacked wild free spins offer all round heart pounding thrills and excitement. Something we’ve not seen in NetEnt games for a while. Go give it a spin at our recommended casino site and see if you can line up those double stacks of symbols.